There is a fundamental naiveté in Francesco Risso’s approach, as well as an effort to impose order on chaos, like a kid making sense of the world. MILAN, Italy — “Elementary, my dear Watson,” said Sherlock Holmes as he unpicked a web of clues to solve another case. Francesco Risso loved the notion of building a collection the same way: clues, codes, signs, a solution. And, like Sherlock, he also described the process as elementary. But that is the fundamental naiveté of Risso’s approach to Marni. On the one hand, there were the raw hems, the dangling threads and primitive top-stitching, the exaggerated proportions, the flagrant colour scheme (“women screaming with colour,” he said). Elementary. On the other, there was the effort to impose order on chaos, like a kid making sense of the world. We sat on tightly wrapped bales of bedding and clothes. “After the men’s show, I liked the idea of controlling the waste of stuff,” said Risso. Instead of the fur that Marni’s business was founded on, there was an impressive topcoat cut from the felt blankets removal men use for packing. Recycling, connecting with the natural world…he liked that idea too. “Nature brings us into primitivism,” he added. His models wore peacock feathers trailing dramatically from their ears. It was the second time this week that Victor Frankenstein — the literary inspiration for anyone engaged in the act of roughly stitching new life together – reared his head. Alessandro Michele is engaged on a similar project at Gucci. Risso talked about a “Siamese union, » as in twins conjoined. 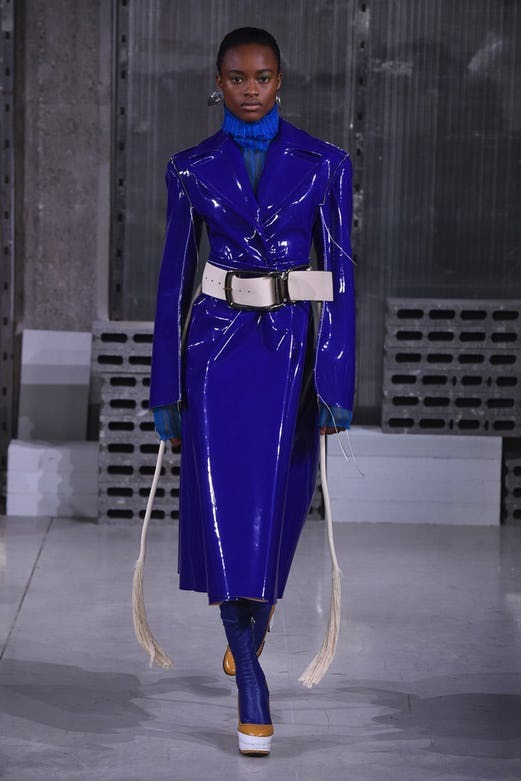 The essence of the collection was that half-and-half: a coat that was half green python, half black leather, another that was industrial felting and hot pink wool. There were schizophrenic dresses that felt sophisticated on this side, turned inside out to lining on that. In one of those naïve leaps of inspiration that seem to be characteristic of Risso, he extended the idea of the Siamese into a whiskery cat motif for coats and jackets. Soundtrackist Frederic Sanchez complemented it with a recording of opera singers’ warm-up exercises. They apparently “miaow” over and over again. Weird and wonderful. There was joy and fun in Risso’s Marni, but there was a message too.